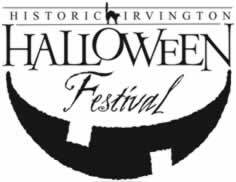 We can’t say it snuck up on us but the Historic Irvington Halloween Festival is upon us once again. We’ve been working late nights getting the store restocked and adding new product to the floor. In the last two weeks we’ve added Naplab‘s Indianapolis neighborhood map, Indianapolis Dining Cards, crochet scarves from Deborah Novick, vintage vphemera from Stephanie Dean, Just Pop In! popcorn (including their new Osiris Pale Ale chocolate flavor), Indiana shirts from Hayes & Taylor, crock pot meals from U-Relish, skinny ties from Workhorse Goods, necklaces and tree ornaments by Glak Love, loose leaf and bag tea from Treehouse Herbs, and art prints and greeting cards from Laura George. Not only will Homespun be bustling today but there are a couple dozen vendors in an INDIEana Handicraft Exchange tent across the street, a Sun King beer tent, eats from food trucks and local restaurants and more along east Washington St. We hope to see you! “I’ve always been a ‘crafter,’ knitter and sewer thanks to my crafty mom,” Heather Saunders says. 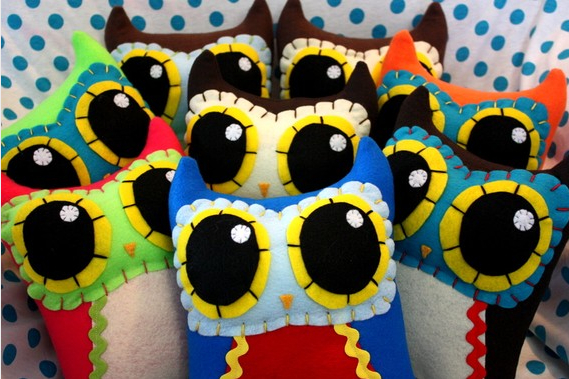 The maker of large-eyed plush companions and accessories “started designing and sewing toys five years ago while working at a bookstore, sort of on a whim based on some of my silly doodles,” she says. Sally Harless has been pursuing art since early childhood despite some early discouragement. Harless moved from interior decoration to high school classes and crafting, an immersion in ‘zine culture in college and a Bachelor of Fine Arts in printmaking. 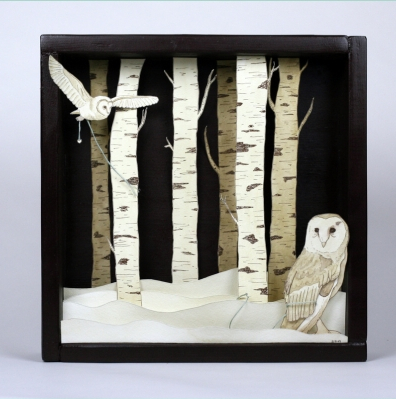 Now Harless makes ink and watercolor illustrations that she sells as prints, jewelry and printed shadow boxes. “After I graduated, I sort of just fell into selling my work at craft shows, and realized that I could make a living at it,” she says. In addition to operating Sadly Harmless, Harless is one of the makers behind the Bloomington Handmade Market as well as Paper Crane Gallery. Sadly Harmless Fun Facts: I have a chocolate dog named Ramsey. I love root beer. In a past life I was a whale. Based in: Indianapolis & Greenfield, Ind. Aaron Dickinson was a swashbuckler in a previous life. “I started making wood swords for my friends and I to play with in middle school,” the wood worker says. He began building furniture in high school and when he graduated, made furniture to help pay his way through college. 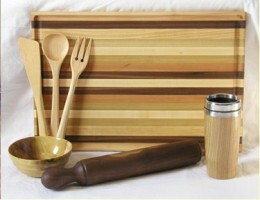 Now, in addition to large custom pieces like benches and entertainment centers, Dickinson turns wooden bowls and makes a wide variety of cutting boards, sandwich and cheese boards, rolling pins and kitchen utensils from Indiana woods, many of which you can find at Homespun! Dickinson Custom Furniture: 1. I have been married for seven years and have two kids (a toddler girl and infant boy). 2. I like reading and playing games with friends in my free time. 3. We, along with our neighbor, raise chickens, guinea fowl, and ducks (meat and eggs); goats (milk), and rabbit (meat). 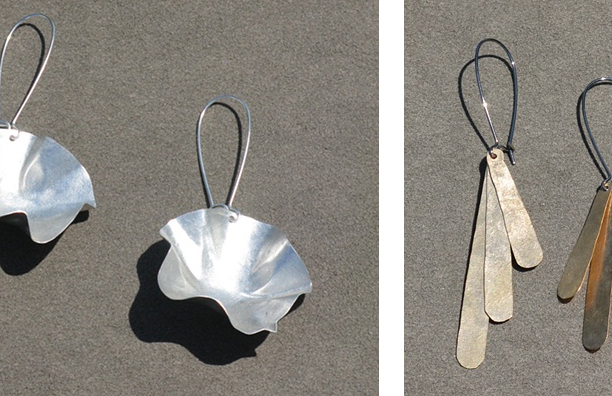 Nine months out of the year, Ecklebarger hammers those found metals into what she calls “conversational accessories for the home and body as well as costumes for spectacle.” The other three months of the year? She prepares income taxes. Glean Design Fun Facts: 1. We grow almost all of our own food on five acres in northern Indiana, including hops, which we make into delicious beer. 2. I am practicing to be a klezmer fiddler. 3. I love to make home-made soda pops, including dandelion soda pop, lavender soda pop, and anise hyssop soda pop. All of them come from plants in my garden and are very lightly sweetened with cane sugar or honey.